This is probably an odd way to start a Thanksgiving post, although I am thankful for my morning coffee. Here's the thing. I ordered this poster from an artist in the Czech Republic! Isn't the world a small place? 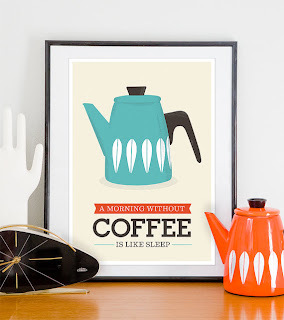 This is the picture from her shop--I don't have that awesome catherineholm orange coffee pot or that retro clock. But I just love the happy colors of my new poster that has come from around the world. In the last week I have been getting to know a friend who has linked to Really Random Thursday. I love her funny and witty writing. It made me want to get to know the person whose writing I was so enjoying. Little did I know she would change my world in a small but significant way. My friend, Elisheva, is from Israel. Israel! So what started as a little conversation on my end of "Hey, thanks for linking up. I love your writing...." then turned into "Is it hard to get fabric in Israel?" which then turned to a request on her part for prayer for peace, not just world peace, but to make changes in my own life. On this day of Thanksgiving here in the US, I encourage you to read Elisheva's current blog post. Give thanks for friends and family. But if you live in a place where you do not listen to planes flying overhead and sounds of bombing, give thanks for the peace of quiet. Elisheva has a list of ideas. She ends by saying, "Cultivate peace.Put it front and centre." I confess that peace isn't always something I actively think about. I want to change that. Happy Thanksgiving to all I hold close to my heart. Elisheva is clearly very wise, how nice to have encountered someone so inspiring. Blessings on you and yours today.....and everyday! I always love your random posts. I do love your new poster! I have a student from Israel right now, so I've been thinking about these things about peace for the past couple of weeks. Thanks for giving us all pause. Happy Thanksgiving to you and Mark! Hope you have a great day. Coming from Northern Ireland I understand where she's coming from, but it did get better there after 90 odd years, so there's hope! Thank you for this reminder! Have a happy Thanksgiving! What a wonderful way to make new friends, especially from the other side of the world. I count my blessings every day for the peace and quiet of my house and my neighborhood. So I pray for peace in her life too! Hope you had a happy Thanksgiving!